Nissan’s flagship sedan throws down 300 horses. 2017 Nissan Maxima SR Midnight edition. 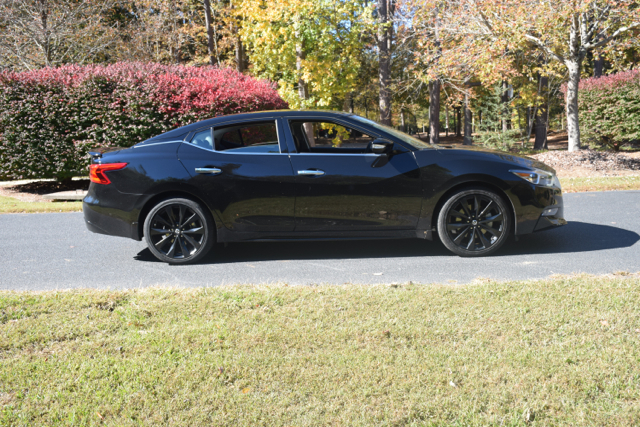 The 2017 Nissan Maxima defies easy description. Or categorization. On the one hand, it is a mainstream midsize sedan. 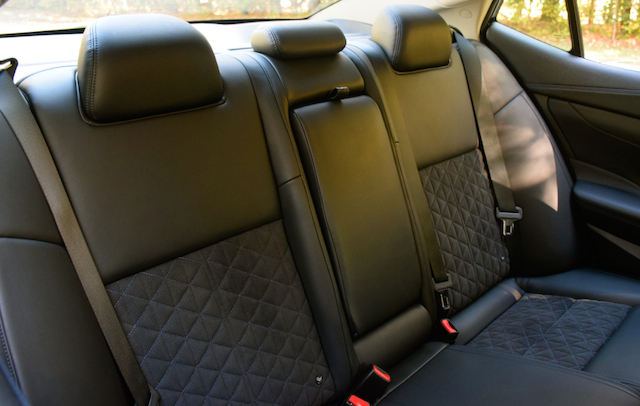 On the other hand, its upper-end trims rival the high-quality interiors you find in some luxury models. Adding further confusion to the mix is its 300-horsepower, V6 engine — a high output version of a tried and true engine found in other products, including the Altima sedan. What the 2017 Nissan Maxima represents is the flagship sedan for the Nissan line. It is smaller than other leading sedans, including the Dodge Charger, Toyota Avalon, Chevrolet Impala, Hyundai Azera, Buick LaCrosse, Ford Taurus, Kia Cadenza, and the Chrysler 300. Indeed, the Maxima is based on the same platform underpinning the midsize Altima — it is the latter model offering slightly more interior room. Regardless, the Maxima is a heavily reworked sedan and stands on its own merits. The last big change for the Nissan Maxima took place in 2016. That’s when Nissan rolled out its eighth-generation model. For 2017, the Maxima is simply carried over — the only change is the addition of Apple CarPlay compatibility. Nissan makes the 2017 Maxima available in six trims: S ($32,560), SV ($34,540), SL ($37,040), SR ($37,820), SR Midnight ($39,015), and Platinum ($39,990). Our test model was the SR Midnight, equipped with the expected SR features — a sport-tuned suspension, an integrated dynamics control module, 19-inch aluminum alloy wheels, and premium Ascot leather-appointed seats with Alcantara inserts. The Midnight edition brings in gloss-black wheels, a black sport spoiler, and a black rear diffuser. In Nissan parlance, Midnight means blacked out. And it was. The current-generation Maxima has a look that you’re either going to love or hate — perhaps intensely so. I first set my eyes on the current Maxima during a media preview at the 2015 New York International Auto Show, where it was revealed just two months before its release. Ambivalence was my initial reaction. Quite honestly, I didn’t know what to make of it. On the one hand, I thought it was a bold design, one that was a clean departure from the previous model, while still offering strong hints of Nissan’s current design language. On the other hand, I wondered what consumers would think as ultimately they are the final arbiters of car design. It turns out the horseshoe grille, floating roof, and wild tail lights have done nothing to discourage buyers. Indeed, after five years of steady declines, Maxima sales this year are better than what we’ve seen in more than three years. That says a lot in a market where car sales have been steadily declining as customers shift their purchase decisions to crossovers. 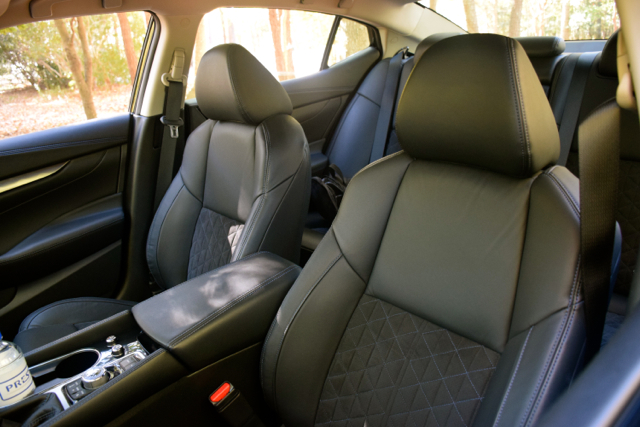 Choose the Maxima SR (our test model) and you’ll benefit from 19-inch aluminum-alloy wheels, a sport-tuned suspension, and Premium Ascot leather-appointed seats with Alcantara inserts. You also get aluminum pedals, a heated steering wheel, adjustable ambient lighting, heated and cooled front seats, an 11-speaker Bose audio system, Nissan Connect with navigation and Apple CarPlay, and one of my favorites: a driver’s seat extender for added thigh support. On the safety front, the Nissan Maxima was an IIHS Top Safety Pick+ recipient in 2016. The standards are tougher this year, so there is no guarantee of a repeat. Even so, we think most customers will be pleased with what they’ll find available on top trim models — blind spot warning, rear cross traffic alert, forward collision warning with emergency braking, front, and rear parking sensors, and the usual complement of airbags, stability control, and other expected safety features. The Nissan Maxima is a 4DSC. In fact, “4DSC” is embossed on both the headlights and the tail lights, resurrecting a term originally used more than two decades ago to describe the Maxima. Spelled out, 4DSC means “four-door sports car,” what’s supposed to underscore an anything but ordinary sedan. It is a risky move on Nissan’s part for a front-wheel drive model powered by a 3.5-liter V6 engine making 300 horsepower and 261 pound-feet of torque. It comes paired with a continuously variable automatic transmission. So, let’s get the obvious demerits out of the way first: A normally aspirated V6 and a CVT do not make for a performance car. A twin-turbo V6 paired with a manual gearbox or a dual-clutch transmission represents an ideal pairing. And that doesn’t even address the sedan’s front-wheel drive platform, the final nail in “this is not a sports sedan” coffin. It is at this point where Nissan’s marketing semantics must be carefully considered. First, Nissan isn’t claiming the Maxima is something beyond what it is — you simply wouldn’t put this vehicle up against a Dodge Charger, unless that Charger was powered by a V6 engine. 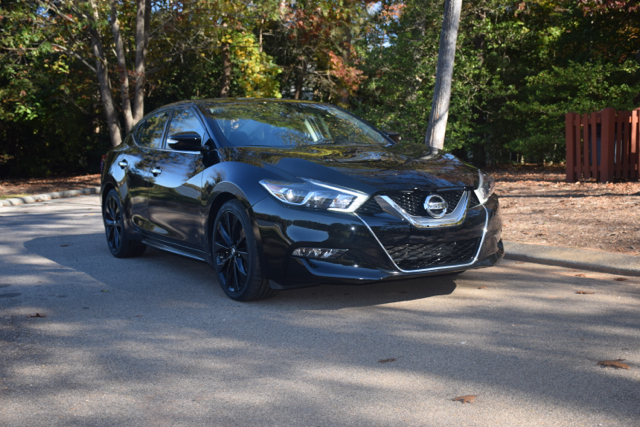 In this example, the Maxima has a strong chance of not just competing, but defeating the Charger on the straightaway, giving its slight edge in power (300 hp v. 292 hp) and its even larger weight advantage — the Maxima weighs nearly 400 pounds less than the rear-wheel drive Charger V6. Without having the advantage of testing both models side by side, the performance and weight differences give the Maxima a decided edge when battling the Charger SE. Second, the Maxima adds in other factors to underscore its 4DSC claims. The already discussed exterior style and interior design are two large factors. The other is what Nissan does with the limited tools it has on hand — namely, the engine, transmission, and vehicle platform. Logically, Nissan could have sprung for all-wheel drive to underpin the Maxima. But that would have added cost and weight to the final product. It was CEO Carlos Ghosn, who saved the Maxima from certain cancellation when he stressed the importance of maintaining one of the most recognized model names in the product portfolio, indeed in all of autodom. But saving the name also meant working with what you had — to invest vast sums of cash in a market where customers are exchanging cars for SUVs and trucks would have been foolish. Ghosn and company are anything but stupid — witness the juggernaut that the Renault-Nissan alliance has become over the past few years. So, here’s what you do when slipping behind the wheel of a 2017 Maxima — you throw all comparisons out the door. Every last one of them. Next, take your Maxima on the road as you always do — then listen and learn. Shift the transmission to sport mode and locate the paddle shifters — they’re large, made of titanium, and are fixed to the steering column — three excellent attributes Nissan nailed down. Because it is a CVT, there are no gears involved. Instead, Nissan mimics the shifting you find with an automatic, supplying seven forward “gears” as you play with the paddle shifters. Where this model shines is in its passing power — if you’re driving in fifth or sixth gear and need a sudden boost of power, the transmission “downshifts” to second or third gear and the engine roars. 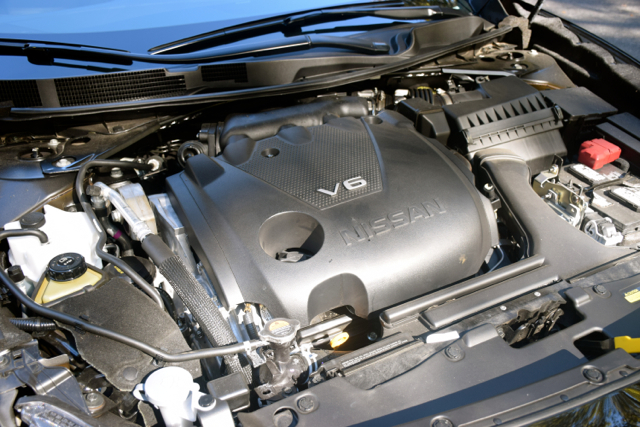 Nissan employs what it calls “D-Step Logic Control,” what allows the engine revs to rise and fall. As a result, you receive an extra burst of power when you want it. The bane of front-wheel drive cars is torque steer — at least in larger models such as the Nissan Maxima and with maximum horses at the ready. Under hard acceleration torque steer is apparent, but as soon as it kicks in, power shifts away from the offending wheel. On the straightaway, this problem isn’t much of a big deal. 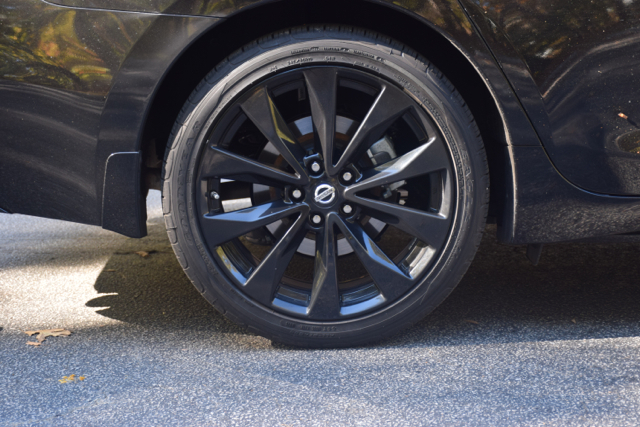 On curves, it most certainly can be, but this is where “active trace control” kicks in, described by Nissan as what “…automatically engages and adjusts brakes on the inside and outside wheels when you corner, providing you with the optimal line through turns.” In other words, you won’t find yourself battling with the steering wheel to keep the 2017 Maxima on pavement. 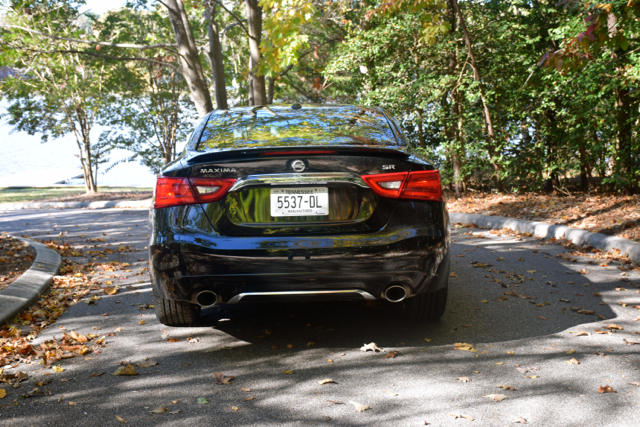 Other Maxima SR features include sport mode, what sends select engine noises through the speakers. Here, you’ll also enjoy sharper throttle response, quicker shifts, and improved communicative steering. Remember when I said earlier to throw all comparisons out the door? Well, let’s bring them back in. First, if you compare the Maxima SR to the 370Z, you’ll be sorely disappointed. Thankfully, no one in Nissan has even suggested such a comparison. Second, the 2017 Maxima is best compared with other front-wheel drive models, including the Honda Accord, Ford Taurus, and the Toyota Avalon. It matches well against all three, although the performance differences are much narrower than you might think. Then again, it would hardly be a stretch to compare the Maxima SR with the Audi A6 2.0T, especially when it comes to the quality of materials used — the Nissan more than holds its own. Finally, Maxima shoppers can’t help but also consider the Altima, offering virtually the same size and a slightly detuned version of the V6 engine and at a lower price. Nissan loyalists who also have an affinity for Infiniti may also discover that the base trim, rear-wheel drive Q50 overlaps the top-trim Maxima in price.